Inside the New UW explores the projects, people, and policies that drive the Wisconsin Idea forward. 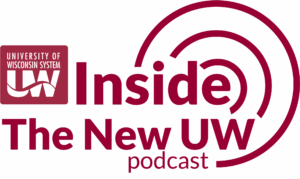 Episode 1 – Restructuring: In this episode, we dive into the catalyst for the biggest change to the UW System since the 1970s and discuss how the UW is adjusting to meet changing demographics and workforce needs. Guests: Karen Schmitt, UW System Interim Vice President for Academic and Student Affairs, and Robert Cramer, UW System Vice President for Administration.